These are some of the critical findings of the 2018 STATE OF IT Report from Spiceworks. It looks like it will be a pivotal growth year for technology. Budget growth will lead to additional staffing over the next 12 months. Almost half (44%) of the companies surveyed expect their IT budgets to rise an average of 19%. Nearly the same amount (43%) expect them to remain the same. Where will the extra dollars be spent? IT departments, particularly in larger companies, are expected to grow in size. 70% of enterprises with 5000+ employees say they’ll increase their IT staff. More than 60% of companies with 500+ employees will hire more IT professionals. 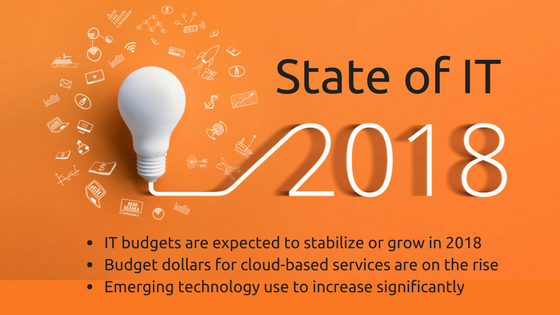 While hardware and software will make up the most considerable part of the budget in 2018, hosted/cloud-based services are growing quickly. More businesses expect an increase in their cloud budget and a decrease in their hardware budget as compared to the previous year. Adoption of new technologies has risen and is expected to grow significantly in the next 12 months. Here’s how the organizations surveyed reported their current use of new technologies. In the coming 12 months, more companies are expected to implement these emerging tech trends.